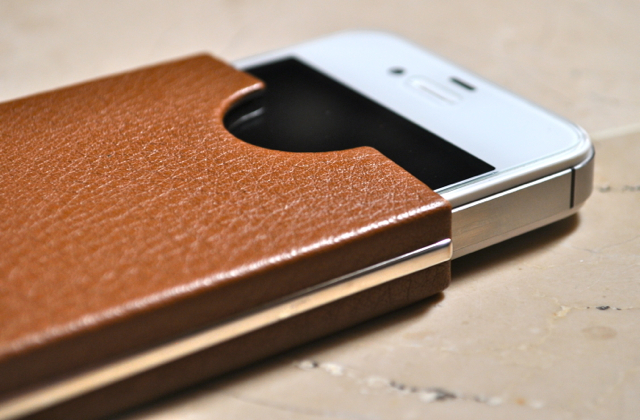 A lot of iPhone 4/4S owners like to cover their delicate smartphone with luxury cases, most popular of which are the handcrafted leather pouches. 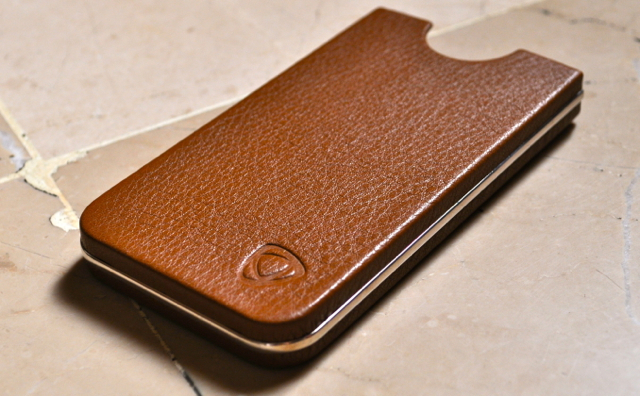 A couple of weeks back, we reviewed once such line of premium cases i.e Sena’s Elega cases for iPhone 4/4S, in a variety of leather colors and textures. 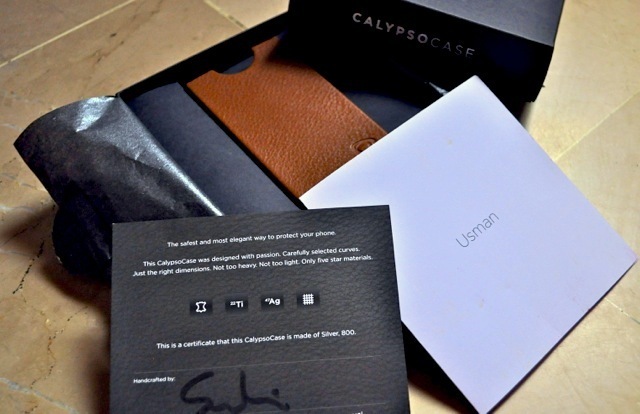 Today, we’ll go hands on with another handcrafted luxury leather case, the CalypsoRing for iPhone 4/4S by Slovenia-based Calypso Crystal. Full review after the break! Specially designed micro fabric inner skin. Strong and light titanium inner enclosure for ultimate protection. U-shaped CalypsoRing made from real silver. 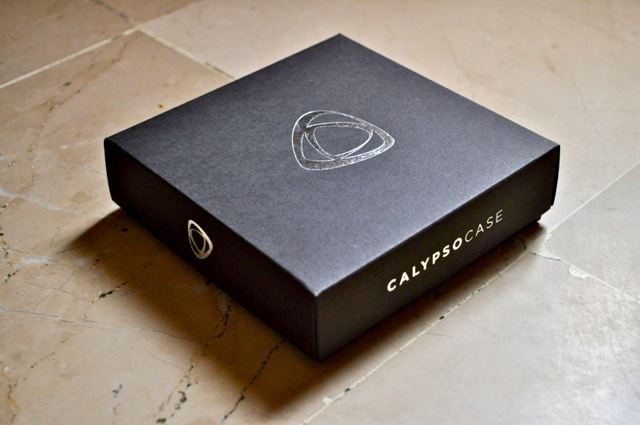 Calypso ships its luxury product beautifully packed in a premium black box. It is available in 4 colors i.e Zurich Night (black), Bilbao by Storm (green), Austin Chill (brown) and Bubbly Sydney (yellow). 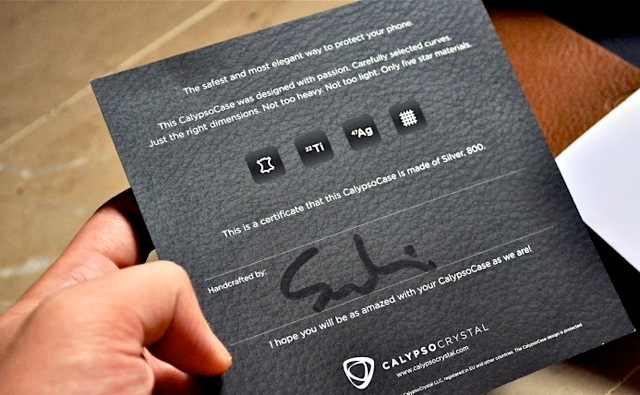 Opening up the box reveals the CalypsoRing case nicely wrapped in a gift paper along with a signed certificate of authenticy and material composition. 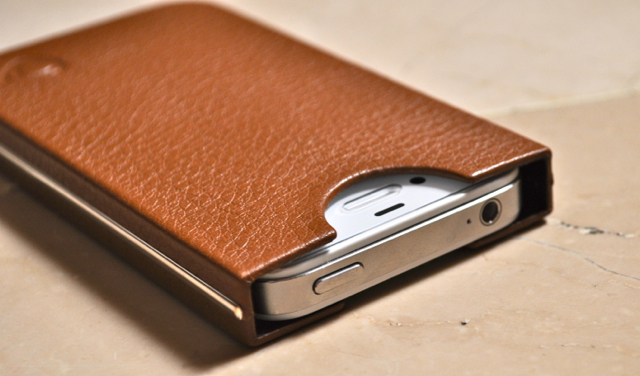 The brown colored premium leather CalypsoRing case is undoubtedly the most elegant iPhone 4/4S case I’ve ever come across. 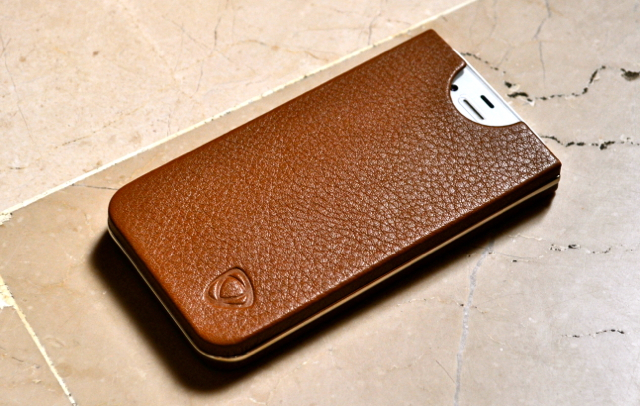 Made with highest quality Italian leather, the precision handcrafted case is lightweight, sleek and stylish. The leather’s texture is extremely smooth that gives it a luxurious look. The premium leather feels superb to touch and smells great too. The case is lined internally with micro fabric that prevents the iPhone from sliding out and at the same time protect the phone’s screen. The inner skin is enclosed with a titanium enclosure for maximum protection against bumps and falls. 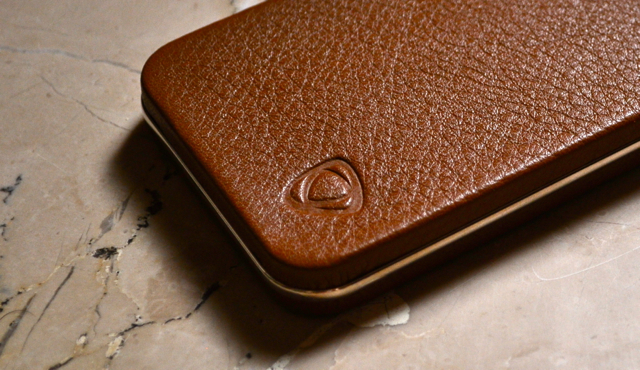 I addition to premium quality Italian leather body, the case is also lined on the outside by a U-shaped CalypsoRing made up of pure sterling silver which is hammered into place in the old-world tradition. The hand polished silver ring truly gives the case an epic touch of luxury. 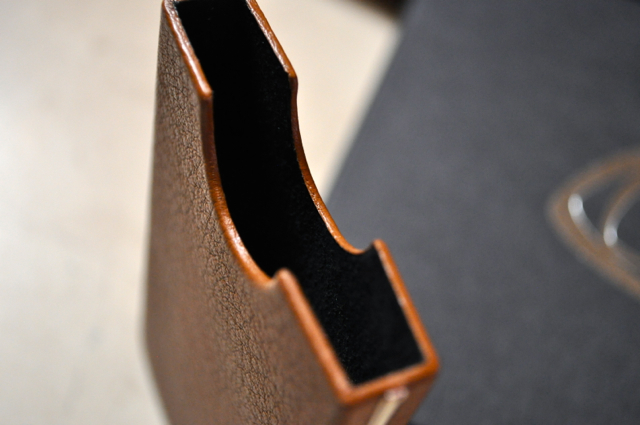 Using the slip-in leather case is an equally pleasing experience. 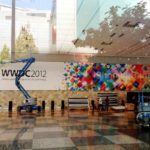 The iPhone slides in nicely and stays in with just enough grip to prevent it from falling out. 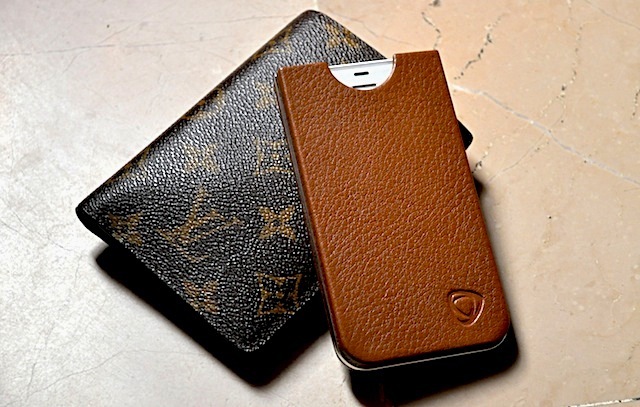 A gentle pull is sufficient to take the iPhone out, as opposed to Sena’s Elega cases which are a bit too tight out of the box and you actually need the leather to break-in and soften with time. Luckily, no such issues here. The fit is absolutely perfect. In the end, I must mention that my iPhone 4S has the SGP GLAS.t tempered glass screen protector on it and I’m pleased to report that CalypsoRing case is 100% compatible with it. Even with the thicker screen protector, the iPhone slides in and out nice’n easy. Made with some of the finest materials on earth, Calypso Crystal’s CalypsoRing case for iPhone 4/4S is a stunningly beautiful high-end case that is both stylish and protective. 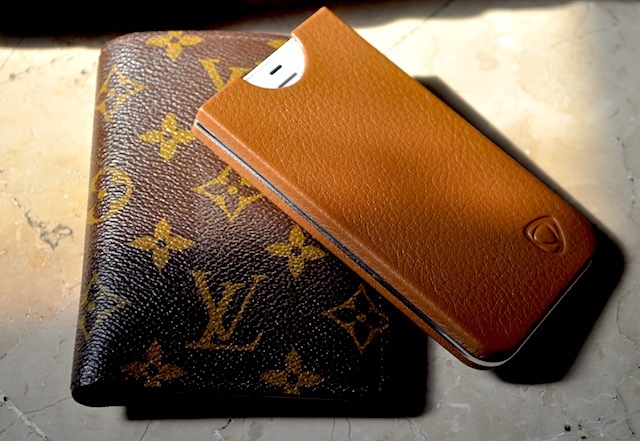 I would recommend CalypsoRing to all those fashionistas who can afford to pay the higher price tag and would like to flaunt their favorite gadget in a perfectly styled Italian leather case.